Set during the 1980s, Autobot warrior Bumblebee finds himself stranded alone on earth, pursued by both evil Decepticons and angry human soldiers. 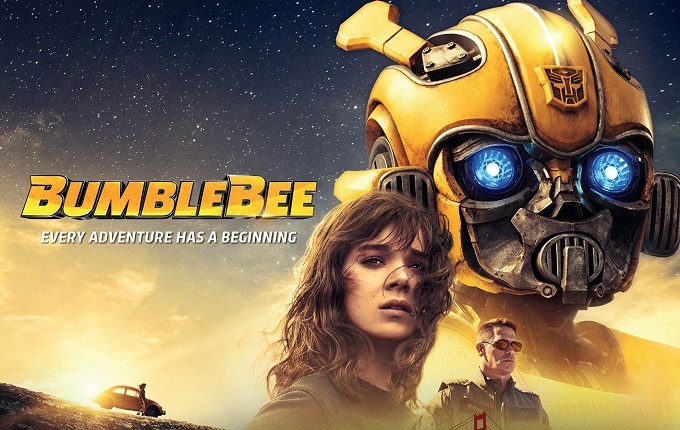 With the help of a young earth girl, Bumblebee must to find a way to save earth despite these overwhelming odds. Director Travis Knight had already established an excellent pedigree for visual style with his gorgeously animated film Kubo and the Two Strings. He does a great job here in finally delivering a Transformers film that looks far closer to the iconic 80s cartoon design than the increasingly messy and unrecognisable Michael Bay movie franchise. The film’s opening scenes on an embattled planet Cybertron teases brilliant versions of classic characters like Soundwave, Ravage, Star Scream and Optimus Prime. Aside from the look of the Transformers the film also does well to capitalise on having an authentic 1980s setting. The film’s period soundtrack is a perfect mood setting tsunami of classic pop tunes. Combined with frequent crowd pleasing pop culture references it helps the film tap into the rich vein of nostalgic fun which has kept fans so patient with the Transformers film franchise. Much like Netflix hit retro series Stranger Things, this film’s look and feel is perfectly matched to the classic film’s it seeks to emulate. The film’s central plot about a fragile young girl befriending a stranded intergalactic robot borrows successfully from the affectionate legacy of films like Short Circuit and E.T. Hailee Steinfeld is a great fit for Bumblebee’s teenage companion and does fine work at making the personal melodrama and planet saving action feel equally real and important. She has an authentic endearing quality that far exceeds the vast majority of ‘teen’ heroes. WWE superstar turned actor John Cena is also a god fit for his role as a determined Special Forces agent. He shows genuine flashes of humour and copes capably with the predictable explosion packed set pieces. The film’s titular hero Bumblebee also deserves much praise, as the special effects team manages to inject even greater levels of heart into the already beloved plucky yellow robot. It’s refreshing to see time spent developing a transformer as a genuine character rather than just briskly introduced as a lazy stereotype as the previous Transformer films have done. It is unclear precisely how this film is supposed to relate to the existing Transformers franchise. While it seems to serve as a prequel to the previous five Transformers films, it makes a number of noticeable changes in both plot points and visual style that sits inconsistently with those existing films. It would perhaps have been better if Hasbro had more confidently rebooted the series, learning from some of the very obvious mistakes of Michael Bay’s past efforts. While Bumblebee is a very popular fan favourite character, it’s also fair to say that the film torments audiences by only offering only teasing glimpses of all the other iconic Transformers. While the film deliberately sacrifices scale for more concise and convincing storytelling, it’s hard not to wonder how magnificent a full epic ensemble Transformers film made in this style could have been. Bumblebee showcases the tantalising possibility of how well Transformers could translate to big screen in the right hands. A much improved visual style and focus on emotive storytelling represents a colossal improvement for the previously bloated and bland franchise. Plenty of 80s nostalgia, a good cast and a great soundtrack make this a fun ride, even if sadly it may prove to be a one off adventure rather than the start of a triumphant reboot.